A house is only as strong and durable as the foundation upon which it is built and rests. The same logic applies (metaphorically speaking) to your trade show booth. Your trade show booth is only as strong and as solid as its foundation, and that foundation is the design you create for it. Yes, there are other aspects of your overall trade show marketing foundation, such as pre-show planning and promotion and post-show follow-up, but those are the subject of other posts here, so for this post we’ll just go with the concept that your display design is the foundation of your trade show booth, and you want to make sure you’ve got a strong and solid foundation! While a lot of exhibitors get caught up in wanting a dazzling, amazing, fantastic, and/or incredible trade show booth design, if you want your design and hence your trade show booth to actually be EFFECTIVE, then your trade show booth design must have a rock-solid foundation, which consists of these three critical design elements… the metaphorical cement, aggregate, and rebar of your design. First, the cement for your design foundation… your trade show booth design must grab attendees’ attention as they stroll past your booth. 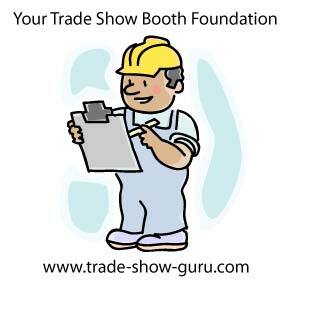 Understand that your trade show booth is just one of literally hundreds of booths at the show. You don’t want to get lost and overlooked in the trade show crowd. Your design must distinguish your booth from all the other booths. When visitors walk by your booth, you’ve got to have a something to capture and command their attention. One always reliable way of “getting noticed” is to have a catchy slogan, motto, or tag-line with a captivating background image (that relates to your trade show marketing message and theme, of course)! Second, the aggregate for your design foundation… your trade show booth design must clearly state your company name and what it does, or put another way, who you are and what you do. Your company name should be “front and center” in big bold letters (this is not the time for a “hip” or “cute” font). Under your company name, explain what your company does in one or two short phrases. If someone looks at your trade show booth and doesn’t instantly know who you are and what you do, then your design foundation is missing the critical aggregate and it needs to be torn down and you need to start over. Third, the rebar for your design foundation… your trade show booth design needs to communicate W.I.I.F.M. (What’s In It For Me, with “me” being your prospect and potential customer). This is by far the most important part of an effective trade show booth design. It’s the critical rebar that holds your design foundation together! People want to know how you can help them, which is why they’ll either stop and talk to you, or just keep walking. For example, if you are a web hosting company, you might mention your uptime performance record and reliability (which had better be excellent, of course) and all the extra value-added services you provide. No matter what, your design must let prospects know how your company can help them. If your trade show booth design has these three critical elements (the cement, the aggregate, and the rebar), then you’ve got the all important design “foundation” which insures that your trade show booth design is effective. Then you can focus on adding other elements to create the most incredible, dazzling, and amazing trade show booth design ever. Just first make sure you never forget to start with a rock-solid design foundation!